If you are looking to create a sense of graceful elegance within a space while enjoying the luxuries offered by modern technology, motorized window shades are a perfect solution. Not only are they available in a wide selection of high quality, designer fabrics, they can also be adjusted with the simple push of a button or tap on a touchscreen. You can make adjustments yourself in order to facilitate your ideal mood, or program a variety of presets that can be used as desired or scheduled to automatically shift as the day flows by. When combined with other home and office automation solutions, your motorized window shades can be coordinated with other actions, such as the dimming of dining room lights for a romantic meal, or powering down the office at the end of the day. Motorized window shades come in a wide range of sizes, styles, and patterns, making them appropriate for the most sophisticated homes as well as professional or corporate spaces. At home, you can entertain with ease as shift your shades to create the ambiance you require. In the office, you can prepare for a conference space for a presentation with the push of a button, darkening the space to draw attention to video, or brightening the space to increase the feeling of energy. 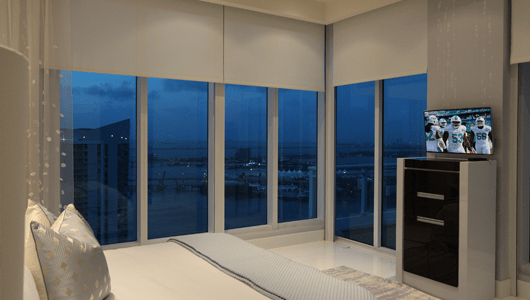 Whether you are looking for fully motorized window treatments in Miami or basic motorized shades in Fort Lauderdale, we are available for a consultation. Bring a piece of Hollywood, FL home or business and enjoy the following benefits. The hot Florida sun can cause energy costs to skyrocket. By installing motorized shades in Florida, you can create a more energy efficient home or office by adjusting the shades instantly as the temperature shifts. By programing the shades to adjust to the shifting sun throughout the day, you can allow the sun to light your home or office, saving you money on your electric bills while maintaining a light and bright atmosphere. Your motorized shades can be programed to adjust automatically throughout the day. This can increase the overall sense of security in your home when it is vacant by making it appear as if someone is home. The material choices available for your motorized shades is as vast as those that are available with traditional window coverings. This allows you to select your level of transparency, ranging from the lightest sheers to full blackout curtains. Whether you are looking to preserve the fabrics in your home, protect valuable artwork, or just decrease your personal exposure to UV rays, you can set your shades to filter the amount of direct sunlight coming into a space. With the ability to coordinate the movement of multiple shades within a space, or all of the shades throughout your home, you will experience a symphony in motion as the silent motors perform your selected choreography with the subtlest amount of direction.